The Beer Box was established in 2011 with the sole intent to provide a beer store to Puerto Rico that would be dedicated to providing different beer styles coupled with impeccable and hospitable service to customers. 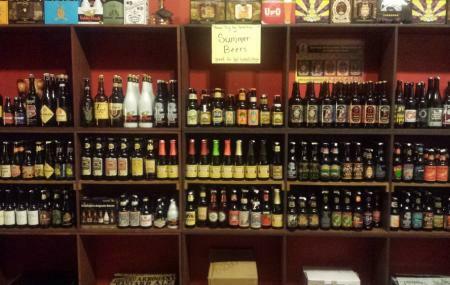 In fact, The Beer Box holds the honour of being Puerto Rico’s first and only craft beer store with over 200 varieties. It also provides beer enthusiasts with information about various craft beers. Also, they organize and host educative events and beer tasting sessions for people throughout the year. Ask waiter for recommendations or restaurant specialities. Private Parking Lot for vehicles. How popular is The Beer Box? People normally club together Verde Azul Sup And Eco Tours and Tinto Wine Shop while planning their visit to The Beer Box. Local microbrewery near Aquadilla with a great selection of beer. Knowledgeable and friendly staff. Supposedly good food but we arrived too late and kitchen was closed already! Pretty good selection of craft beers. Great ambiance and even better staff. Highly recommended! Excellent place to grab a different beer on. Love the decor, a home feeling since the moment you walk in. Loved it, definetly coming back.